If you enjoy travelling to Christmas markets and eating good food, Riga, the capital city of Latvia, is a place to consider visiting. During 2018 Latvia will commemorate a century since the country’s independence. A century you may wonder? During World War Two Latvia became part of the Union of Soviet Socialist Republics but independence was restored in the early 1990s. Despite having been an independent nation for a generation, Latvia still has the feel of a place that’s largely unexplored by Western tourists. Illuminated arch at the Christmas market by the Evangelical Lutheran Cathedral of Riga. The city has a positive buzz and hosts a number of chic bars and boutiques. Modernists (Krišjāņa Barona iela 31) combines being a design store and a place to meet and enjoy a glass of Champagne. The Rocket Bean Roastery (Miera iela 29/31), meanwhile, is a laid-back café and coffee roaster that imports its beans from Central America. Slow-cooked pork belly served with seasonal vegetables at the Mute restaurant in Riga. The dish is garnished with edible flowers. In terms of the quality of its food and culinary presentation, Mute (Tērbatas iela 63) has a lot to shout about (see what I did there?). The team from Mute’s kitchen are shown on the photo I’ve selected as the header for this post. Lamb burger served with in a black bread bun at the Mute restaurant in Riga, Latvia. The burger features a slice of French cheese. One of my favourite meals of the trip was at the subtly illuminated restaurant Garage (Elizabetes iela 83/85), after an evening at Riga’s opera house, the grand Latvian National Opera. Duck breast served in Riga, Latvia. The dish is served with seasonal vegetables. To taste traditional Latvian cuisine, we headed to Niklavs (Mārstaļu iela 1), in the city centre, and Lido, within Europe’s largest wooden building. Honey cake served in Riga, Latvia. The traditional, layered cake is served with fruit. From the perspective of a visiting travel and food photographer, it was great to be able to access high-speed Wi-Fi in cafés, bars and restaurants. That meant I was quickly able to upload and share posts to Instagram and Twitter. Staff at Modernists in Riga, Latvia. Modernists is a concept store combining a Champagne bar, Champagne store and designer furniture. The centre of Riga is fairly compact, meaning that it’s relatively easy to get about on foot between places of interest. If you’re heading further afield then the trams of the public transport system are easy to navigate and, of course, you could always book a taxi if you want to reach an outlying area. The Nativity of Christ Cathedral (Kristus Piedzimsanas pareizticīgo katedrale) in Riga, Latvia. The Russian Orthodox church was built in the late-19th century to a Neo-Byzantine design. Look out for posts from Latvia on Go Eat Do. You can already find a couple from the town of Sigulda, which is approximately an hour from Riga and a good place to head if you enjoy visiting castles, walking and adventure sports. Woman selling cakes at a Christmas market in Riga, Latvia. The lady wears a hat. Riga proved a good destination to explore with a camera. Door of a wooden house in Riga, Latvia. The building is painted green. Take a look at the Latvia Travel website for ideas about things to do and see in the Baltic nation. An Art Nouveau staircase in Riga. The Latvian capital has a high concentration of Art Nouveau buildings from the early 20th century. The Live Riga website has information about things to do and see in the Latvian capital. Snowfall at night in Riga, Latvia. A woman photographs the street. Regent Holidays (020 7666 1244) can offer a three night stay at the Radisson Radzine in the city centre of Riga, Latvia, from £395 per person. The price is based on two sharing on bed and breakfast basis and includes return flights and transfers. Rainis monument in Riga, Latvia. Rainis was the pseudonym of Jānis Pliekšāns (1865 – 1929), a Latvian poet and playwright. Air Baltic flies from London’s Gatwick Airport to Riga International Airport. The duration of the flight is two hours 40 minutes. 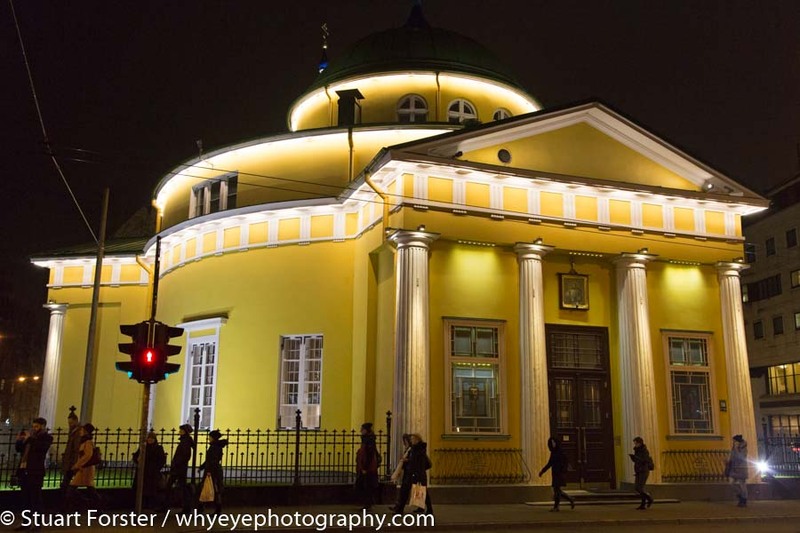 The Saint Alexander Nevsky Orthodox Church in Riga. Disclosure: Stuart visited Latvia as part of a group familiarisation tour organised by the Investment and Development Agency of Latvia. This entry was posted in Food Photography, Travel Photography and tagged Food, Food photography, Latvia, Riga, Sigulda, Travel Photography.